I just spent way too much time trying to perfectly synchronize the cable box on the bedroom TV with the alarm clock. There was something like a 15 second lag, so the box would change to 2:35 and for 15 lonnnng seconds the alarm clock would still be on 2:34. It was driving me crazy. Sigh. I used to plow through them each week, and by Thursday I would be sad that I had to wait another week to read them. Now, ehh, not so much. I have them piled up going back a few months. 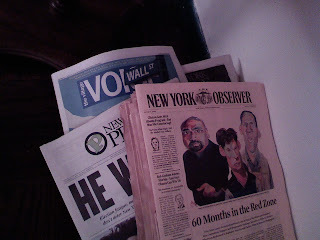 But since I can't throw out papers or magazines until I read them, I'm currently in the middle of the Voice dated Oct. 29(! ), and, for some bizarre reason, wasted five minutes of my life reading an article about election fever among the Bangladeshi community in Brooklyn voting for their local reps. An election that was in November, in a community I have nothing to do with. But it was interesting, so, you know. (That God I don't even bother with the East Side Resident, AM New York, NY Metro-type freebies). I can drink Bailey's Irish Cream and enjoy it, even though it's basically liquid chocolate, but a wine that tastes a little too sweet makes me gag. Haha the clock thing can be annoying but I wouldn't go so crazy over it.